Akame ga Kill! is the anime adaption of Takahiro's shounen manga of the same title, which is illustrated by Tetsuya Tashiro and was serialized in Square Enix's Gangan Joker since April 2010. The anime is also produced by Square Enix and is licensed by Sentai Filmworks for release in North America. The anime follows the source material through the first eight volumes of the manga, utilizing some events from the later issues as well, before concluding with an exclusive story arc that diverges from the manga. One misconception in the anime industry is that when a show is dark and contains excessive amounts of gore. Many people automatically think the show is deep and thought provoking. The problem is that many anime studios get so hung up with making the show as badass and dark as possible that they forget about the more important problems that might plague the show, like character development and pacing. Akame Ga Kill is a great example of this problem. The story follows Tatsumi, a countryside boy that travels to the capital to join the military and earn money to send to his village suffering from poverty.To him the capital is a place filled with opportunities and a happy life. But after reaching the capital he soon realizes exactly how corrupt the capital is. After certain events he is recruited by Night Raid, A group of assassins that wish to overthrow the government and end this corruption. On the surface Akame ga Kill does seem to be different from other shounens because of it's dark theme and excessive gore. But when you look a little bit deeper Akame ga Kill is actually pretty similar to other stereotypical shounens. You have characters always blurting out the obvious. You have the naive yet strong protagonist that powers up over time. You have almost all of the female characters fall for the protagonist. Akame ga Kill tries to be different show with it's dark theme, but looking at it closer there isn't much difference. Probably one of the more prominent problems in Akame ga Kill is the comedy. The problem isn't in the comedy itself. (Though I admit most of the humor was stale) but rather the execution. Apparently someone thought it was a good idea to slide in a petty joke in many emotional or dramatic scenes. Probably the best example of this would be a scene where Tatsumi finds out about the corruption in the capital and mourns over his loved ones that died to this corruption. This was supposed to be a very emotional scene but then Night Raid kidnaps Tatsumi and makes petty jokes along the way. It is scenes like this that make me unable to take the show very seriously. The characters in the show are filled with problems too. Tatsumi isn't really much different from other stereotypical male leads. He's strong, kind, and has a great sense of justice. Something we see in pretty much any other male lead for a stereotypical shounen. The other characters in Night Raid don't fare much better either. You have Mine the tsundere, Bulat the "Aniki" type. Shelle the klutz, Leone the "Onee-san" type, Lubbock the perverted guy, and Akame, the cold assassin. Now considering the show has Akame's name in the title. You would expect Akame to be one of the most important characters of the show. Sadly, the only background we do get to know about Akame is her backstory. She didn't seem to have much development and emotions except for a few scenes.Almost all of the characters feel pretty one-sided and unoriginal. There are two new additions to Night Raid later on in the show. Chelsea and Susanoo. And probably out of all of the characters in Akame ga Kill, I found Chelsea to be the most memorable.Why? Because she actually feels realistic. Although Chelsea seems to be very confident and powerful. She is just like any other girl at her age. She likes to use make up, she has her own beliefs, and she felt like an actual person. On the other side you have the Jaegars. A special squad led by General Esdeath which goal is to anhiliate Night Raid and any other group that resists against The Empire. The Jaegars seem to be an awkward bunch. You have Bols, who looks like a psychotic murderer with a mask. Kurome, who apparently loves to eat. Dr.Stylish, a crazy mad scientist. That doesn't mean there aren't normal people there. There is Wave who doesn't really have any special qualities and Run, who seems to be the calm and collected person in the group. If there was a person who could embody the word "crazy". Seryuu probably fits the word perfectly. Probably the most hated character in the entire show. Seryuu is a person who has a completely twisted view on justice. She believes that everything the empire does is right and that everyone who goes against the empire is evil. Now although she is indeed twisted as hell and it is a normal response to hate her guts. I find that she brings a different point of view to the word "justice" in the show. To her the empire is her sense of justice. This outlines the different sense of justice between the two groups and what they are fighting for. Something that the show fails to do in many other places. The characters of Jaegar mostly seemed to be interesting to me, but lack of character development led them to be pretty underwhelming characters. An exception to this would be Esdeath. Probably the most popular character of the show. Esdeath is loved by viewers for her icy demeanor, beauty, and her love of battle. She kills only because of her lust for war and her sadistic nature. She does have a softer nature too, as can be seen when she is searching for love. One thing that I find annoying with Akame Ga Kill is apart from the Jaegars (which mostly were pretty average). Every other villain was bland,exaggerated, and unoriginal that I couldn't help but laugh when I saw them. Most of the supporting villains are either complete psychos or are so obsessed with power that they don't even seem human. This does get better after the introduction of the Jaegars but is it really too much to ask to get a decent villain that I can take seriously? The part that makes Akame ga Kill "different" from other average shounens is that unlike other shounens, characters die and although this is apparently what makes Akame ga Kill "special". This is exactly what makes Akame ga Kill fall short. The problem is that characters don't get nearly enough development before there death.It is usually give the character some screen time in the previous episode. Give them a flashback on there backstories, and send them off. Killing off characters isn't a bad thing at all. In fact, this is exactly what I want from shounens with main characters that either get revived or are invincible. But at least give the characters enough development to actually make the viewers feel something, or else the death scenes feel meaningless. The first opening of Akame ga Kill "Skyreach" is pretty average to be honest. Sure it isn't bad but the song just isn't much better than other opening songs. The second opening is a big step up from the first one with the early part sounding quiet and gentle, but slowly grows into a louder song with guitars and the chorus. Which I found to be pretty fitting to the show. Both the ending songs are pretty good,both bringing contrasts to the opening with softer, smoother tunes.The soundtrack ranged from average to pretty good. The songs in the battle scenes weren't anything special but did there jobs of increasing the tension, but the the best parts are the piano tracks for the moments of death.The piano tracks were pretty simple and weren't complex at all, but the tune the tracks carried brought out the tone perfectly. The animation is mostly pretty good.I guess the best word would probably be "efficient". Akame ga Kill looks good where it counts and it cuts back in parts that weren't that important. And I respect that. Not every anime has a gigantic budget to work on. (Unless its from KyoAni). The fight scenes looked great and although there were a few scenes that were cut back. Those scenes were mostly negligible and not very noticable. 1 - Do I find it unique? hmmmmmm, yeah, sort of. 2 - Do I find it excellent? Absolutely NOOO. (I talking about the Anime, since this is the Anime's review and I didn't read the Manga). Well the story can be simply summarized as follows: "Evil Government doing evil things to poor citizens so The heroes stay in the shadows and take every chance to kill the villains. After many sacrifices, good defeats evil". 1 - "Evil Government doing Evil things". First, (about point 1) it was easy to notice since the first episode that the villains in this Anime seems to be ... Stupid. They do evil because they enjoy doing evil or they do evil because they are too retared to understand the difference between evil and good. only 3 exceptions were found but they aren't given enough screen time in order to be explored, anyway they were still as stereotypical as ever. What is worse is that the plot keep showing off how evil the villains are by making them meaninglessly do thing to show how evil they are. e.g. there was a scene where Esdeath was uselessly talking about how a flower can be used in torture. Second, (about point 2) the Anime tries to force a dark tone by killing off some characters frequently. this caused a severe problem; most characters were not given enough time to show any development, thus their death had no meaning too. It was like the death of some stranger in a car accident; you may feel sorry for him but you quickly forget about him because you know little about him. Those characters who had enough time to develop, either didn't get enough screen time or were just too simple and stereotypical that there was nothing to explore about their personalities. All Akame ga kill characters lack character development that they can only be used as unimportant side characters for a better story. 1 - Death flags: the past of a character is usually revealed shortly before it's death. this was not emotionally effective because of the horrible lack in character development. 2 - Legendary Exclusive Weapons/Abilities: the Imperial Arms had a negative effect on the story. It's unexplained and suddenly revealed trump cards made the battles hard to take seriously as the tension can't be built if we know that the battle can be turned by some magical ability that is made up on the spot. And due to the huge number of Imperial Arms, they felt more of plot devices to for the author to use in twisting the plot without worrying about how logical the twist is. Everything can happen MAGICALLY. 1 - Talk no Jutsu: the villains in Akame ga kill don't change sides just because they heared the sound of our protagonist's pure heart. Unfortunately, the author broke this cliche by making the character so stupid that they can't change. Due to the lack of development, the villains are evil just for the sake of evil or stupidity, so they can never change as the only aspect they have is being EVIL. 2 - Plot Armor: ..... Ahhhhh, I understand that the mass killing of characters was meant for making a lot of tension, but did it really kill the plot armor? I mean, how can I feel enough tension when the battles felt so stupid, Trump Card This, Trump Card That, they even had girl with guns poping out of her throat. Sometimes characters felt like they were dropping some chances to give their opponents some time to counter just for plot convenience. If the author want to keep a character alive all he need to do is to add more bizzareness to the situation so that he can slip the character out safely. What about the protagonists? They were as stereotypical as ever. The main character that believes in justice and wants to protect their Nakama, the super-skilled silent one with dark past, the tsundere, the pervert, etc. Another problem is the revealed past of the characters, they vary from the ones that are so unoriginal that I can't bear to watch them any more like Akame's and Esdeath's, and the ones that seem interesting but are unfortunately left very vague that I can't effectively reflect them on the character's present like Chelsea's and Najenda's. And of course, there is the main protagonist's past that was just "404: Background not found"... No problem anyway, may be there was nothing interesting in it. In conclusion, Akame ga kill showed good potential but was brutally murdered by it's weakly written plot, misuse of cliches and weakly developed characters. the visual side of Akame ga kill was average. while some scene were well-drawn, most action scenes were horrible. e.g. most of Akame's scene were like as if she teleported and everyone in the path between her initial and final position have been slashed. I must compliment the two final episode as the animation were much better than the whole series. the character designs were plain, generic and sometimes out of place, especially Akame who was wearing something like a school uniform in a medieval setting. I liked the openings and endings, and some of the background music were good but nothing really special. I can't really comment on the voice acting because I'm not a Japanese speaker, but I think that they were able to give the intended emotion through their voice tone. I think this is one of those Anime shows that can be enjoyed better when you don't think much about them. I tried to use this technique to enjoy it but I couldn't, the sudden tone shift were ruining it, the action scenes were horrible, the whole series was just boring. Overall, I can't recommend it to anybody, even Bleach is more enjoyable than this IMO. 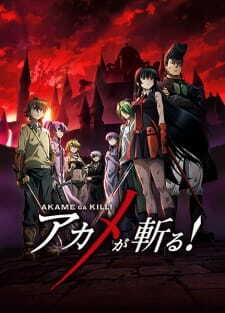 Produced by White Fox Studios as 24 episode series, Akame ga Kill! is the anime adaptation of an unfinished manga that follows the exploits of an assassination group looking to overthrow the corrupt empire. While it doesn't even have good writing or the proper foundations, there is no denying that this show takes its audience for a wild ride that is filled with bloodshed and explosions. Set in a fantasy world, Akame ga Kill! begins with a talented but rather naive swordsman named Tatsumi, arriving in Empire's capital city and dreaming of making a name for himself. He quickly finds himself being stripped of his meager savings by a certain feline-looking women called Leona but comes across a wealthy family who decides to graciously shelter him. That very same night, a group called Night Raid hits the household with the intent of assassination. Through a series of twists that exposes the family's atrocities, Tatsumi accepts the offer to join Night Raid and starts on the path towards to assassinating those who they deem to be responsible for plaguing the Capitol with corruption. However as he and his teammates continues their campaign against those who stand in their way, the Empire responses by creating their own unit of elite soldiers called The Jaegers to hunt down Night Raid. Within each of their own respective arsenals are incredibly powerful weapons called Imperial Arms that were forged in the early beginnings of the empire. From suits of armor to hand-held weapons and gears, the power within each of these Imperial Arms is unique and the main element to the fighting is countering each others power. Tied in with the usage of Imperial Arms, the primary feature that set Akame ga Kill! apart from other action shows is the alarming frequency in which notable characters are permanently killed. As a general rule, when two or more imperial arms users enter into a fight, at least one of them will die giving the show an huge amount of tension when battles do occur. With a focus of ridding the Empire of its corruption, Akame ga Kill! is a very edgy show with that knows no bounds when it comes to displaying the appalling crimes and cruelty that exists within the series. However, the tone that is given doesn't lend itself to be a mature analysis of the mankind's darkness. More time than not, it comes off as being cheap and I found myself laughing at the sheer ridiculousness of it all. The underlying reasons are mere context and background to the real draw of the show of how the bloody battles unfold. For all the horrific violence that the characters commits, the regular cast is a rather likeable bunch. Named in the title of the anime, Akame is the beautiful wielder of the Murasame, a sword that is guaranteed to kill its enemy with a single cut, and is a rather cold individual from onset. Once the series get underway, she does have some genuinely assuming moments and actually cares deeply for her friends but usually adopts a stoic demeanor during operations and for much of her downtime. Tatsumi, being the gullible and starry eye swordsman from the countryside , is the audience's introduction into the rotten and oppressive Empire and the fight bring about revolution. He starts off as fairly generic but develops into a much more powerful fighter with strong relational ties to others. Opposing Night Raid is the head of the Jeagers, General Esdeath, who is a very voluptuous and sadistic women that enjoys the thrill of the hunt. Believing in a very Darwinian principle of the strong devouring the weak, she is a very formidable foe and yet, is a little ditzy when it comes to the matters of the heart. There are too many other characters to list off and go into details but they all share the common trait of being immensely brutal in their fighting while having comical elements attached to them. They themselves are representative of the strange dichotomy where scenes of slaughter, sexual exposition, and torture are offset by their playful comradery. While they don't having the most compelling back stories or development, the cast of Akame ga Kill certainly doesn't shy away from making their presence known by any stretch of the imagination. I would like to give a particular mention to Akame's VA, Sora Amamiya, for continuing to have an astonishing start to her career. In addition to her main role in Akame ga Kill!, she has taken on no less than four main character roles in Nanatsu no Taizai, Aldnoah.Zero, One Week Friends and Tokyo Ghoul. While her time being Akame has come to an end, I look forward what other roles she can play as she moves through the anime industry. Visually speaking, Akame ga Kill! is an above average effort with a very modern style, vivid colors and a few special effects thrown in for good measure. It does rely on conventional animation when going through its action sequences so there's nothing that makes it stand out in that aspect. Otherwise, the quality remains consistent throughout the entire series which is more than I can say for other series airing at the same time. In fact, one area that Studio White Fox have done a tremendous job on improving is rendering the background. While the manga does a decent job at framing its own surroundings, the additional detail and polish put in really elevates an aspect where the source material was lackluster. Taku Iwasaki, known for creating the soundtrack to Gatchaman Crowds, Noragami and Tengen Toppa Gurren Lagann, is responsible the music behind Akame ga Kill!. Judging by his other works, he has been consistently been able to produce music that a bit quirky to listen to but still be able to enhance whatever show he works on. For this series, he incorporates a variety of musical styles from jazz to rock to orchestral music and he does a commendable job of engaging the audience with his music, no matter what the scene called for. I especially like the OST being played during the action scenes as a combinations of drums, tribal chanting and rock goes with perfectly with the unhindered primal violence being shown on the screen. As with almost all adaptation from manga to the anime, some things are bound to get lost in transition and Akame ga Kill! is no exception. Character interactions that gave depth to their relationship are left out but those scenes didn't really contribute in significantly in altering the core plotline. It is only towards the latter half of Akame ga Kill! that readers of the manga will notice that that the rather straightforward adaption will suddenly veer off into the original anime ending territory that leaves behind an entire arc unanimated and takes several liberties with the story. If you are only familiar with the anime TV production, it is unlikely that you would notice much of difference other than the accelerated pacing and build up. At this point, the manga remains unfinished and if the show decided to stay its original course, it would have ended in an awkward state and would have had to wait years before additional material would be available. For a show to tell a complete story in an age where anime shows are mere primers for the source material is a rarity indeed. In the end, Akame ga Kill! sets out what do what it promises and that is to smother the audience with super powerups, violence and death up until the very end. To kill or not to kill, that is the question. In the world of Akame ga Kill, it’s more than just about killing as survival fits to those who wish to live for something to fight for. Sounds complicated? Not really. Akame ga Kill preys on a simple concept despite playing complexity on the tactical front. To put it into simple perspective, we have a prestigious and well developed Capital taking place as the major setting. While it looks industrialized and well functioned on the outside, there are dark secrets and corruption on the inside. The ones who fight this corruption consists of the main characters as an elite unit known as the Night Raid, as part of the Revolutionary Army. They don’t just kill for the sake of it but for a purpose. In this show, that purpose is to rid of corruption as a young man named Tatsumi finds out the hard way. The few episodes wastes little time to get the point across in the AkG world. Tatsumi almost becomes a scapegoat during his journey as he himself believes that Night Raid is evil. In reality, corruption takes hold where he almost ends up being a victim. The truth is realized soon enough as the young boy faces the grim reality. However, he makes his own decision to join Night Raid and rid of the corruption that holds the Capitol and perhaps the rest of the world. Essentially, that’s how it starts anyways but Tatsumi also learns more about the group of people he is allied with now that he is part of Night Raid. As such, the few episodes introduces the other members. Titular character Akame is perhaps one of the most prominent member of Night Raid as her first encounter with Tatsumi almost ends up getting the latter killed. Coming off seemingly as a cold girl with social awkwardness, she is also a skilled fighter with good intentions. The problem with Akame is that perhaps she is a bit way too focused on her motivations. Throughout the series, there’s little depth we realize about herself despite some minor flashbacks between her and a sister she used to hang around with. Her actions throughout the show also seemingly include vengeance not only against the Capitol but her own dear sister. While the reason is explained vaguely, there’s just not a lot we can appreciate about her role. Her relationship with Tatsumi is perhaps the strongest compared to the other members of Night Raid though. So in some ways, we can say that she is a character with a lot of potential but the show just doesn’t make her a well-developed character. Other members of Night Raid falls under a lot of generic tropes. These include head boss Najenda, Leone (the older sister type), Mine (tsundere), Bulat (the older brother type), Lubbock (ongoing carefree dude), Shelee (quiet type), among others. Tatsumi himself is also saturated with generic tropes such as his heroic personality and to do the “right thing”. His motivations does have influence among other members of Night Raid as they see him as a trusting member and one who is determined to achieve his goals. Perhaps one other character in the show sees him as a bit more beyond just a warrior though. Coming from the outskirts of the Capitol is General Esdeath, a feared sadist and leader with a deadly reputation. Esdeath’s debut marks the exact expectation that viewers might have her as a leader. However, her encounter with Tatsumi might rub off in the wrong way. You could call it as an infatuation or obsession, but her personality takes a 180 degrees after realizing the power of “love”. Rather than love though, it’s more like a one-sided relationship as the world of Akame ga Kill is not pretty. If you don’t believe me, then the body count might serve as a more credible evidence. Regardless if you’re a member of Night Raid, Jeagers, Revolutionary Army, or the Capitol’s military, the show isn’t afraid to kill off characters. Esdeath isn’t alone as an adversary of Night Raid however. Leading a group known as the “Jeagers”, she plays a role as an anti-villain. Some of the members of Jeagers have their own morals and ideologies. Still, there’s also this presence of black and white morality that is dominated throughout the series. Some characters such as Seryu (from Jeagers) kill for what they perceive as justice while others simply sees it as an order like Boris. Then, there are also misguided examples such as Wave who doesn’t realize the truth revolving around the corruption of the Capitol. Nonetheless, the series makes a point clear that it controversially creates an atmosphere of ideology clash. And often or not, these result in various consequences such as extortion, torture, and death. Make no mistake though. This show isn’t shy to craft violence from what it has set up. While world building isn’t a strong content of the series, the mechanics and origins is insightful. It is explained in a way that viewers should not be confused. The instance falls quickly with powerful weapons known as Teigu (in English, referred to as Imperial Arms). They are the most widely feared tools that are featured throughout the series with a variety of uses. These include but not limited to invisibility, one-shot kills, animal instinct, sharpshooting, ice manipulation, shape-shifting, pyrokinesis, and among others. The origins behind some of these Teigu are also explored. And with that, you can expect spectacular action when characters puts them to use. Well-coordinated movements, strategies, and jaw-breaking cinematic are a key to this success. Thankfully, Akame ga Kill does that in a profound way. As each Teigu is also different, the show also makes good usage of their strengths and weaknesses so you can expect some exciting duels in full throttle. As I said before, the show had a decent start with what it has done with the adaptation. But this isn’t the main concern of the series in regards to fitting with characters’ roles. It’s the way the story is adapted later on when for some reason, the series derides from the manga. Instead, it crafts filler and makes up its story as it goes. Some of them not only have episode transitions that doesn’t make sense but also ones that are seemingly too rushed. And like I said before, the show isn’t shy to kill off its character cast. However, all is abrupt and devoid of development. There’s little feeling that you’ll feel with some of the characters killed off later on (especially beyond episode 20). It’s almost like an insult for the fans hoping to see a faithful adaptation when it decides to make up its own little story. When it comes to visual quality, White Fox is able to actually get some parts done right. They are able to take this show’s animation quality to a level of what it should be – graphic and straightforward. It remains brutally honest with what it tries to accomplish such as severed limps, beheading, and torture. In short, the show isn’t a fairy tale fantasy but rather make its point as a dark world of malevolence. Action is directed with strength in its movements while the world setting is credible with the backgrounds. Dangerous creatures known as the “Danger Beasts” are present throughout the show as well that are carefully crafted to show their animalistic brutality. On the other hand, character designs can be an oddball. Certain characters such as Akame wear outfits that doesn’t make them look like who they should be. Tatsumi’s design is also blend as the main protagonist while other characters are exaggerated by their manga counterparts such as Esdeath. And the show isn’t shy with fan service either so be prepared for some eye candy goggles. While not a powerhouse, soundtrack does play an efficient role. In particular, action scenes are supplemented by the OST with the intense pacing of the fighting. Emotional scenarios also exist so expect some solemn tunes to play out its purpose. However, character voice mannerisms can be a bite to the heart. Again, I have to emphasize that Tatsumi is one of the most generic characters known to mankind. His voice shifts between mature and childish in what can seem like a split second time-frame. This inadequate balance is a pain to deal with as such with some with other characters albeit with less focus. In essence, the show has moderate voice mannerisms when it comes to its cast. However, I do give praise to the VA for Akame, Sora Amamiya. She is able to play roles as soft spoken characters such as Kaori (One Week Friends) and Elizabeth (Nanatsu no Taizai) but is also able to portray Akame in this series; a cold spoken assassin. Did I also mention that she sings the OP song for the first half? Speaking of which, the theme songs conveys this show accurately with contrasting moods between the opening and ending. To cap this off, it’s easy to say that Akame ga Kill is a show that might not be suitable for everyone. I don’t say this on a graphic content perspective but rather with the whole premise and what it tries to do. In fact, the premise is solid and stays true to itself throughout the show. It’s just that the direction has some crude markings when it comes to timing and balance. The way it derails from the manga adaptation makes it look like a joke. Generic characters are also something to aware of especially in the case of our dull main protagonist Tatsumi. His relationship with other characters only shines when it revolves around the main story. On the other hand, mechanics and concepts of the show deserves praise. While nothing stands out as original, the show is clever with the world setting, themes, and artificial weapons/tools. The show also does justice with the buildup and cliffhangers it creates to anticipate what’s to happen next for the majority of the first half. However at the end of the day, this show is one of those sick series where it kills itself.